Kieran Killeen was astounded when he bought a home in Vermont in 2002, and its title barred minorities from living there unless they were servants. They were empty words. Racial covenants are no longer legal. But Killeen, who is white, did not like having even a defunct racist restriction on his home’s title. He worked with neighbors to have it removed from his and 121 other homes in South Burlington. “It took 70 years to undo the paper trail of institutional racism,” Killeen noted. Unfortunately, this is not just history. Racial covenants and other practices from the housing market’s racist past carry forward in the form of segregated neighborhoods and diminished wealth. They laid the groundwork for the terrible financial toll that black and Hispanic communities, in particular, paid during the Great Recession. Even redlining, a common practice from decades ago in which lenders denied loans in minority communities, has made a bit of a comeback in the wake of the housing crisis. Promising demographic trends could improve the outlook, but some say that’s not enough. 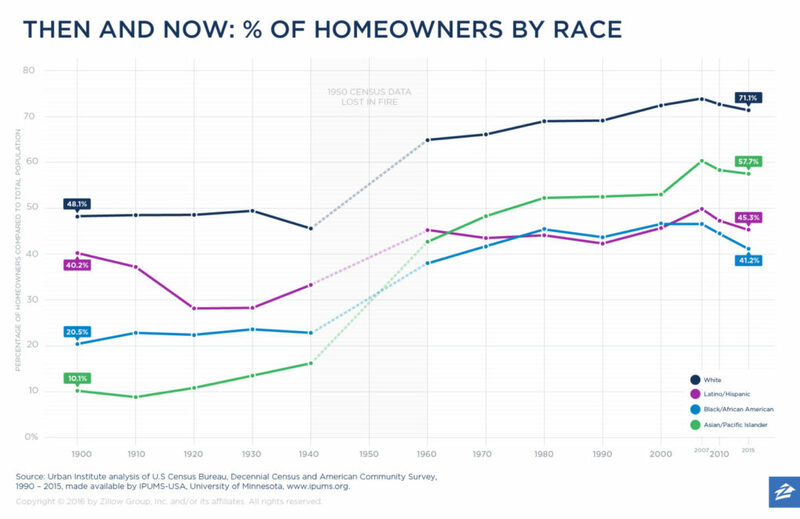 For more than a century, there has been a persistent gap between white and minority homeownership rates. The most recent data show that 71 percent of whites own homes, compared with 41 percent of blacks, 45 percent of Hispanics and 58 percent of Asians, according to the U.S. Census Bureau’s American Community Survey. 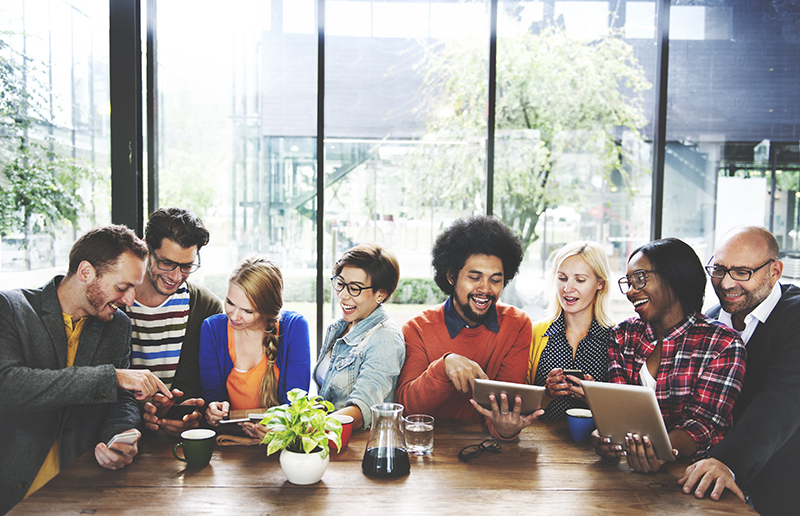 The good news is that the youngest generation of homeowners — millennials — is more diverse. And they’re driving the housing market more than people realized, according to Zillow Group’s Consumer Housing Trends Report. “While minorities remain underrepresented among homeowners, that is changing as a younger, more diverse set of buyers enters the market,” said Zillow Group Chief Marketing Officer Jeremy Wacksman. In fact, half of all home buyers are under age 36. Although the housing market as a whole skews heavily white — with black, Latino and Asian homeowners each representing less than 10 percent of the market — there’s greater diversity among millennials in general, and among millennials who own homes. Only 66 percent of millennial homeowners are white — much closer to whites’ 61 percent share of the general population. It’s also encouraging that Latinos and Asians have begun to narrow the gap between their homeownership rates and that of whites. But the gap between whites and blacks has widened. Aside from a run-up during the housing bubble, the homeownership rate for African Americans appears to be in a long-term slump. That bleak picture follows decades of gains. The economic fortunes of African Americans began to improve after the Fair Housing Act of 1968, when it became easier to challenge redlining, racial covenants and other forms of discrimination. By the 1990s, blacks had finally established a foothold in the housing market. However, during the housing bubble, many of them fell victim to mortgages that were unwise, and in some cases downright predatory, said Rolf Pendall, co-director of the Metropolitan Housing and Communities Policy Center at The Urban Institute. “If you owned a house in a community where only 40 to 45 percent of people owned houses, and you had friends and neighbors and cousins, many of whom were less well off than you were, you might take money out [via refinancing] because you’re helping people get through,” he said. At that time, even African Americans and Hispanics with strong credit were steered toward subprime or predatory loans, said Coty Montag, deputy director of litigation at the NAACP Legal Defense and Educational Fund. A former Justice Department attorney, she helped litigate a Department of Justice case against Wells Fargo for such steering that led to a $234 million settlement. As a result, black and Hispanic neighborhoods were hit harder and have bounced back more slowly from the housing crisis. “We look every day at sad faces when people are not able to get those loans,” said Antoine Thompson, national executive director of the National Association of Real Estate Brokers. It’s the oldest minority real estate trade association in the country, representing African-American and other minority real estate professionals, and it supports movement toward a new credit scoring model that takes into account rent and utility payments as well as non-traditional forms of income. The Great Recession meant a tremendous setback, compounding earlier forms of housing discrimination. Those historical practices included government-sanctioned redlining and racial covenants in the mid-20th century that kept blacks from buying homes and building wealth at the same time whites were. There were also personal assaults, sometimes literally. Being aware of the past’s injustices is the first step in understanding homeownership among African Americans today. Read more about African Americans and homeownership. The outlook for Hispanics is brighter, and surveys show they are more likely than any other racial or ethnic group to associate homeownership with the American Dream. A hefty 70 percent of Hispanic respondents told Zillow that owning their own home is necessary to living that dream, compared with 64 percent of Asian/Pacific Islander respondents, 63 percent of black respondents and 58 percent of white respondents. “Homeownership is an aspiration for almost all Latinos,” said Lautaro Diaz, vice president for housing and community development at the nonprofit National Council of La Raza. For good reason: Owning a home can be key to economic stability, better health and more education. Hispanics face many of the same hurdles as African Americans, including a knowledge and familiarity gap regarding homeownership. Given Latinos’ lower incomes — they make $19,000 less than whites, on average — it’s particularly important for them to create a strategy for buying a house, sometimes as a family. “They have to channel their resources into buying a home and not necessarily sending money back to family in Mexico or Latin America,” Diaz said. Read more about Hispanics and homeownership. An aversion to debt also hurts minorities disproportionately. Almost 20 percent of Americans are “credit invisible” or “unscorable,” according to the Consumer Financial Protection Bureau. In low-income neighborhoods, that figure is closer to 45 percent — and there’s a divide along racial and ethnic lines. Only 16 percent of white consumers are “credit invisible” or “unscorable,” while 28 percent of black consumers and 27 percent of Hispanic consumers are. “We meet people all the time who are excellent money managers but have no credit, and no idea that they have no credit,” said Ricki Lowitz, founder and executive director of the nonprofit Working Credit. She was a speaker at Zillow’s 2017 Economic Forum in Washington, D.C. Some are immigrants who don’t trust American financial institutions. Some are African Americans who were told by parents and grandparents that if they didn’t use credit, they’d never go bankrupt. “You have to borrow to build credit, and that’s a hard message,” Lowitz said. Here’s the catch: Most landlords, utilities, cable and cell phone companies do not report monthly payment information to credit bureaus the way mortgage and credit card lenders do. In the Asian community, there’s an added wrinkle: Some Asians are averse to debt because it carries negative connotations in their home countries, said Christopher Kui, executive director of the nonprofit Asian Americans for Equality. Some are used to paying cash, or having to put 30 percent to 40 percent down on a home purchase, he said. If they have that large a down payment in the United States, the amount they borrow might be so low that they will not get the best interest rates from lenders. “We do a lot of classes and workshops about how to save for a home, how you really have to take care of your credit history and delinquencies, and what the system looks for when you apply for a mortgage,” Kui said. Read more about Asians and homeownership. Kui and others suggest several ways the system could improve, including new credit scoring mechanisms and new mortgage products for people who don’t fit the standard home-buying mold. One example is VantageScore, a project of the three major credit bureaus that uses a different model, scoring at least 30 million people who otherwise would be invisible to lenders. Not all low-income advocates love it, saying some measures can be discriminatory. But it’s an alternative for some people who have no score in the traditional system, said Alejandro Becerra, director of research at the National Association of Hispanic Real Estate Professionals. “Banks could also take into account multi-generational income, seasonal employment and entrepreneurship like driving for Uber,” Becerra said. It’s the kind of opportunity A.P. Giannini seized when he founded Bank of America — then Bank of Italy — back in 1904. At a time when banks catered mostly to the rich, this son of poor Italian immigrants built the largest bank in the country (by the time he died) by making loans to the working class. “Be ready to help people when they need it most…. It’s the helping hand on a dark day that folks remember to the end of time,” he advised. Dedrick Asante-Muhammad, director of the Racial Wealth Divide Project at the nonprofit Corporation for Enterprise Development (CFED), believes that to make real headway, low- and moderate-income minorities need the same sorts of progressive economic programs — from mortgage insurance to subsidies for the building of middle-class suburbs — that whites enjoyed. In the ’40s and ’50s, whites rocketed from 46 percent to 65 percent homeownership with those economic boosts. Minorities were explicitly left out via redlining, racial covenants and other practices. Without aggressive intervention, by 2043, the wealth divide between white families and black and Latino families will have doubled, according to a study by the CFED and the Institute for Policy Studies. If white wealth remained stagnant, and black and Latino wealth continued to grow as it has for the past 30 years, it would still take black families 228 years and Latino families 84 years to gain parity. The point of reaching more minority borrowers is not to make everyone a homeowner. Owning a home does not make sense for some people, including those who move frequently or who make so little money that they would have no financial cushion if they put everything into a home. The aim is to even the playing field so that people with the means to own a home have a fair shot at it.